Bleeding Crowns are red-capped mushrooms that are commonly found on cave floors. Bleeding crown and tundra cotton have both Fortify Block and Resist Magic effects, making it easy to create a dual-effect defensive potion. 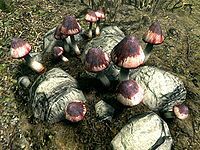 "The caps of these mushrooms do indeed appear smeared with blood, though it is often hard to see in the dark, damp places in which they grow. Not uncommonly found in Skyrim, their abundance is countered by the difficulty in acquiring them. As any experienced herbalist knows, the darkest of caves often conceal far more than mere mushrooms." 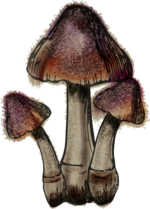 "Nonetheless, these potent fungi, when combined with certain powdered antlers, produce a mixture rendering one quite susceptible to poison. Their usefulness is also quite apparent when mixed with Lavender, creating a substance highly resistant to magic." - Agneta Falia in the Herbalist's Guide to Skyrim. In terms of combinations of two ingredients, Bleeding Crown can be combined with 29 other ingredients. This page was last modified on 16 February 2019, at 21:43.